We’re thrilled to announce the general availability of Release 5.2, the latest version of Sunbird’s Data Center Infrastructure Management software. This release includes enhancements that drive DCIM ease of use and security, including pre-configured dashboards, a thermal floor map and time-lapse video, door lock security management, enhanced rack capacity and failover reporting capabilities, and trap filtering and forwarding. "Intelligent PDUs and other smart devices generate a significant volume and variety of data in data centers today, and data center managers are struggling to use it to their advantage," said Herman Chan, President of Sunbird Software, in a statement. "DCIM 5.2 puts users in control of their data. Configurable dashboard widgets and other innovative features enable users to engage with data in ways they never could before, and they are able to do it quickly through a modern, responsive interface. When data center managers can stop wasting hours during the day sifting through spreadsheets and instead focus on the KPIs they need at the click of a button, the result is deeper, more actionable analytic insight that can immediately improve every facet of data center management." This release of our DCIM software includes dcTrack® 5.2 DCIM Operations and Power IQ® 5.2 DCIM Monitoring and is available worldwide on a cabinet/month subscription or perpetual license basis to all customers with valid maintenance contracts. Simply download the update files from Sunbird’s support portal to upgrade today. Accelerate data analysis and reach your insights faster with interactive, pre-configured dashboards. 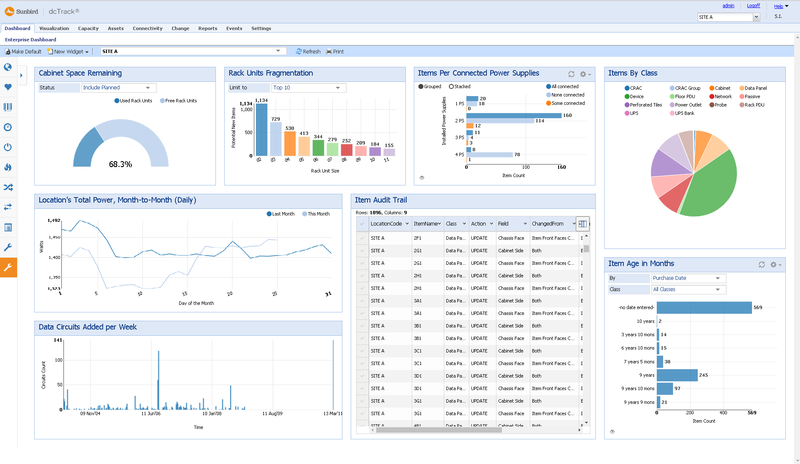 DCIM 5.2 features dashboards that are pre-configured with over 60 widgets for one-click access to common health, asset inventory, space, power, cooling, and connectivity metrics. Simply drag-and-drop your widgets to customize your dashboards and engage with the data that matters most to you. Built with AngularJS, these DCIM dashboards ensure that you always have the optimal view of your data in a sleek, modern interface. Identify hotspots before they form with the new thermal map and time-lapse video. Using data from the temperature sensors already deployed throughout your data center, the time-lapse overlay helps you pinpoint hotspot formation on your 3D floor maps. With the thermal map enabled, any of the currently available power, environmental, and capacity visualization reports can be run to provide an additional dimension of data for more precise planning. "Sunbird has made significant progress in its pursuit of a single-pane-of-glass DCIM that enables data center managers to efficiently utilize capacity, maintain uptime, and boost productivity," said Rhonda Ascierto, Research Director of Datacenter Technologies at 451 Research. "Implementing AngularJS and other modern technologies to power useful features like interactive dashboards and time-lapse thermal videos creates an environment suited to the complexities of today's data centers." Door security support in DCIM 5.2 ensures that you can always keep track of who goes in and out of your data center. Manage permissions and access requests from within the software. Having a single, centralized system for door access management helps you save time, eliminate the stress and hassle of manually tracking access, and even meet HIPAA and other compliance requirements. You can even set doors to relock automatically. No more worries about engineers and operators accidentally leaving doors open. Simulate a failover situation to identify at-risk cabinets without impacting your equipment in use. In DCIM 5.2, the software's popular failover report, supports cabinets with multiple PDUs and even allows you to create failover PDU pairs yourself. You’ll see at a glance which cabinets are in danger of exceeding the redundancy threshold as well as those with the most and least available power capacity, so you won’t be caught unaware in case of a power chain failure and instead can be assured of maximum uptime. To download the release, you need a valid maintenance contract and user login. To obtain a user login, visit http://support.sunbirddcim.com/support/login. Your email address and associated company information will be validated. To download the release, login to the support portal at http://support.sunbirddcim.com/support/login and click Software Updates & Docs. For more information on what’s new in DCIM 5.2, check out the press release . Ready to upgrade? Download the upgrade file on the support portal.